Cartier, which has a long history of more than one hundred and fifty years, is a famous manufacturer of jewelry from France. Jewelry and wristwatches made from Cartier have been masterpieces that celebrities and famous stars want. Cartier has created lots of works with extraordinary creativity and high end craftsmanship. 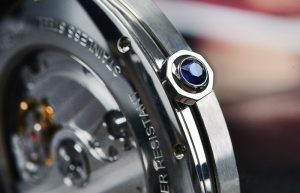 Cartier leads the fashion trend in the watchmaking, like the wind vane. It’s good at fusing the classic watch case with classical elements, showing unique fashion flavor. Drive De Cartier watch has left a deep impression on the public and been another classic series since it made its debut at SIHH 2016. The New Drive de Cartier is inspired by the dashboard of the antique car. 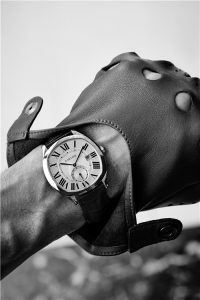 Some series of many famous watch brands borrow some elements from antique cars or cars, but Drive De Cartier stands out from the competition. 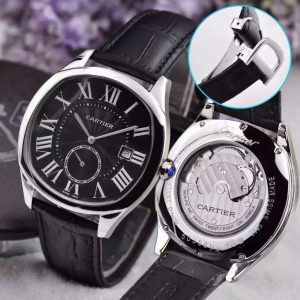 Here Drive De Cartier watch WSNM0004 is introduced, decent and elegant. The sleek lines of the cushion-shaped watch for 40 mm(length) * 41 mm (width)case create fashion flavor. Blued-steel sword-shaped hour and minute hands go around the Silvered flinqué dial elegantly. 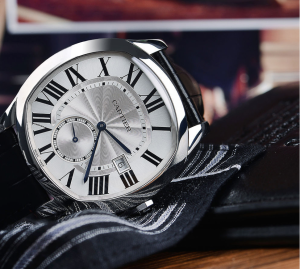 Calendar aperture at three O’clock, small seconds counter at six O’clock and vintage Roman numerals show the beauty of fashion and classic beauty. The small seconds counter is decorated with ring patterns, showing the delicate craftsmanship. Semi-matte brushed sides of the steel watch case. Rounded steel lugs connecting to the exquisite case look smart, fine and suitable for the men’s wrists. The octagonal steel crown set with a faceted synthetic spinel sets off elegant and powerful charm, and the spinel reveals good taste. The new watch case is equipped with the leather strap. Comparing with the steel bracelet, black semi-matte alligator skin strap with 18 mm steel double adjustable folding buckle brings wearers light and comfortable wearing experience. After years of refinement, the movements made from Cartier’s workshops in La Chaux-de-Fonds have matured. In honour of the first Cartier Santos watch, the movement which was based on ETA 2892-A2 was named as Cartier Cal. 1904 MC. As one of in-house movements, Cal. 1904 MC launched in 2010 has been the mainest basic in-house movement. With polishing process, the modified Cal. 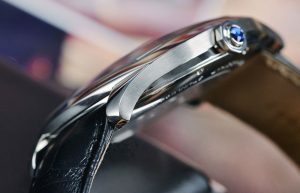 1904-PS MC is seen perfectly throughout the sapphire crystal. Cartier’s 1904-PS MC mechanical movement is an automatic mechanism – the watch is wound by kinetic energy, and the swing of your arm as you walk is enough to keep it ticking. It uses double barrels (most automatic watches traditionally have one), and this gives it a highly constant chronometre throughout the duration of the watch’s 48-hour power reserve. This means the watch will display time accurately and consistently for two days after you take it off your wrist, even though at that point it’s no longer getting wound by the movement of your arm. Water resistant to 3 bars / 30 meters, so the wearers protect your watches away from diving, bath or saunas.